The season of wet-and-muddy is upon us, and with it, an opportunity to embrace all manners of sensory play, mud-puddle math, nature art and interdisciplinary integration! Have boots? Will play! Mud puddles provide endless hours of sensory fun, and an incredible opportunity for authentic learning! How deep is the water? How much water is in a really big puddle? What could it fill? A bucket? A bathtub? How could we even measure it?! 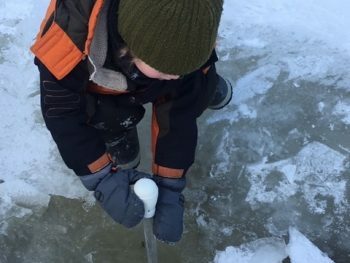 In her blog Puddle Play – Rethinking the ‘Math Classroom’, Deanna Pecaski McLennan, PhD, elaborates the “measurement, counting, capacity, classification, time and quantity” that can all be explored authentically in a puddle. This is rich learning where play and adaptive reasoning intersect. Math can happen anywhere, and outdoors doing something most children love is the perfect place! Turkey basters That turkey baster that only gets used twice yearly?! An incredible (and FUN) instrument of transfer and measurement: squirting distance, volume transfer – comparing between one container and another. More math and measurement?! Try Mud Kitchens! Cooking up delicious “recipes” in a mud kitchen requires only a few second-hand kitchen implements like muffin tins, metal bowls, collanders and spoons. 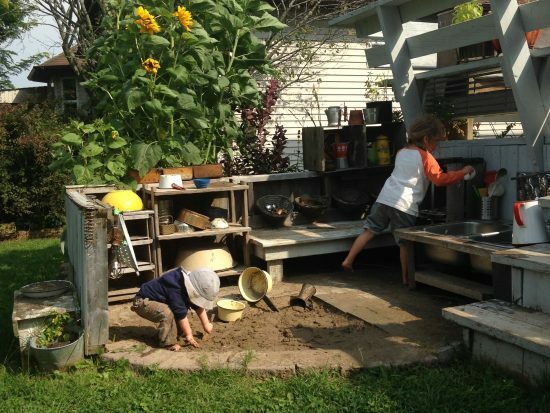 This can be on-the-ground immersive play or hands-in-a-sandbox in a wood or brick enclosure (pictured below). Second-hand stores are inexpensive sources for utensils, and places like the Re-store offer inexpensive sinks and accessories for more elaborate builds! January 23, 2019 – Three cheers to all the teachers, parents and students who completed surveys for the Pathway pilot sites. What a lot of great information you provided! We received 684 surveys that help us learn what’s important to you and the challenges in your life. We were impressed by the thought and effort shown by the responses. Parents shared lots of great ideas for outdoor activities for each season; teachers find a much bigger challenge in getting outdoors with their classes, with fewer ideas for larger groups of children. For parents, the biggest barrier to getting outside is lack of time; for teachers, it’s lack of resources, ideas for outdoor activities, and support. Parents indicated relatively low worries about safety when their families are outdoors; teachers are very worried about safety issues (liability concerns are huge). Teachers love to use natural areas in their schoolyards, if they’re available. They find it difficult to take classes off the school property. Families love to spend time in familiar places, especially family cottages, farms or their own backyards. They also love local parks, especially if they’re easy to get to. Most-mentioned favourite public places include Riverview Park and Zoo, Jackson Park, Millbrook Trails, Rogers Cove and Peterborough’s trail system. 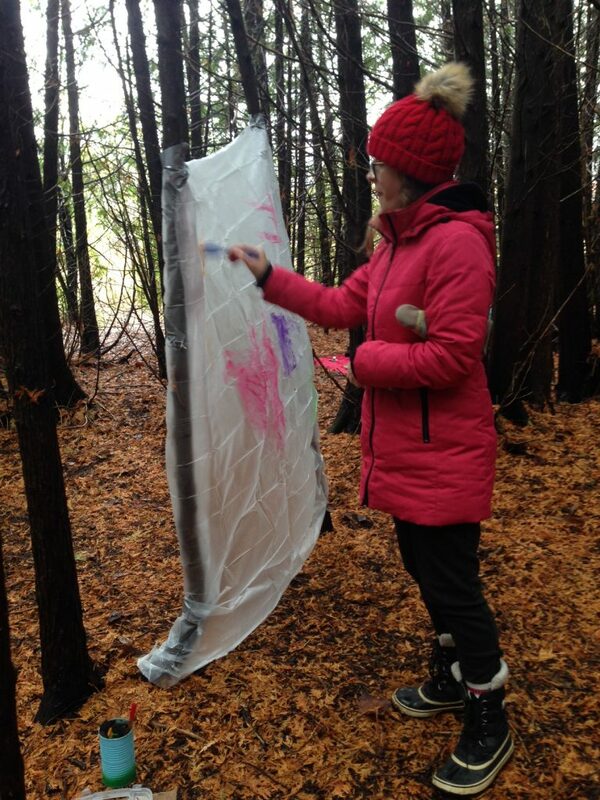 Teachers and parents want IDEAS for outdoor games, nature art, crafts and songs. The majority of teachers and parents said that their interest in the outdoors was greater than their knowledge – many felt they didn’t know much about nature. Most teachers and parents said that their students/kids were very interested in the natural world. Teachers and parents who completed our surveys all agreed that physical activity, outdoor play, and play in nature are very important for children. Based on these preliminary responses, you’ll find some ideas for nature games, crafts and other activities on this website. January 23, 2019 – Our Cold, Wet, Muddy and Fun! workshop with Sue Ferren was so true to name! Not only did we experience first-hand all of the chilly temps, rain, mud and snow within the span of our Saturday morning together, but we enjoyed a rich morning of learning, sharing and FUN. Sue revealed the magic that can be found when we courageously bundle our wee ones and venture out, whatever the weather! All 15 folks who attended, including 2 wee ones, were led on a clear pathway to providing the invitation, clothing and materials necessary for children to explore, create and engage in any weather. Sue shared her wealth of knowledge, beautifully curated resources, an enviable nature-themed library, and a treasure trove of hands-on activities – both indoor and out – for us to explore. She also shared the challenges and barriers we know can keep the most intrepid explorers from venturing out, and ways to make that challenge more manageable and more fun. In the warmth of the Camp Kawartha Environment Centre we brainstormed Barrier Breakers, models of how to bring nature in, loose parts of every description, and shared stories of mishaps and magic-making with wee ones in all weather. 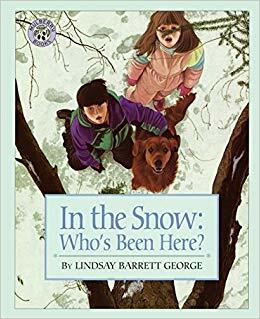 Then we were invited outdoors on a beautiful story walk with the laminated pages of In the Snow – Who’s Been Here. The story trail wove us through the cedar grove and opened to a clearing lovingly spread with activity centres showcasing simple and powerful activities to spark early years engagement. Mud kitchens, rain-filled tube mazes, tarp painting, and making nature-found masterpieces within empty ornate frames – all ready for hours of exploration. The wee ones who had been enjoying the morning under the watchful care of Jumping Mouse’s Martine Cleary, joined us to explore these centres. It was immediately obvious that with a few thoughtful materials, comfortable all-weather clothing, and adults willing to venture out, cold, wet and muddy are Fun! Want Inspirations and Ideas for venturing out this Winter? 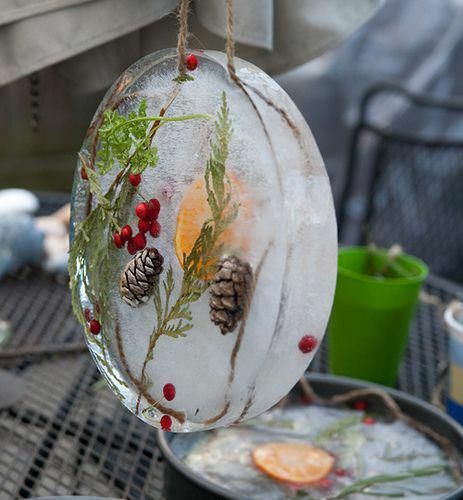 Join us Saturday February 9th for Wonder-Full Winter: Your Toolkit for Nature Crafting and Outdoor Play with Children.